There’s nothing quite like a garden in full bloom. And nothing says spring like a row of breathtakingly beautiful flowers blossoming in a variety of colors. But all that beauty comes after some serious work. There’s planning, planting, maintenance and more. Make sure you know exactly how much sunlight each area of your garden gets so that you can purchase the appropriate flowers for each spot. Observe your garden’s sun exposure throughout the day before choosing your seeds or plants. Annuals vs perennials: there are advantages and disadvantages to both. Annuals only live for one season, but are typically cheaper and bloom all season long. Perennials last several years but have a shorter blooming life and are usually more expensive. Variety will make your garden pop. For incredible results, diversify the colors, heights, and flower types throughout your garden. Plant climbing roses near a lower flower bed. Use a row of evergreens to create a darker backdrop for brilliantly colored flowers. Zucchini. The summer squash grows quickly and is simple to plant and care for. Peas. Snap and snow peas take several months to grow. You can plant them early in the season, even before the soil is completely warm. Tomatoes. Sweet cherry tomatoes grow quickly and will turn any salad into a gourmet dish. Choose an area that gets full sun exposure. Cabbage. Cabbages hardly need any care; just be sure to use slug bait to keep those critters away. Before you get started, check your seed packets for the best planting time in your region. Don’t plant too early or too late in the season. It’s also important to plan your garden in full detail before you start digging. On the day of planting, your soil should be moist and prepared for seeding. 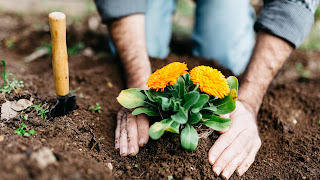 When planting each seed or flower, first determine how far beneath the soil that particular plant needs to go. Then dig an appropriate hole and add fertilizer as per the package instructions. Incorporate the fertilizer into the soil. Next, place your seed or flower in the hole and fill the hole with soil. Lastly, add mulch to help ward off diseases and weeds. The amount of water each flower needs for growth can differ greatly. Make sure every plant in your garden gets the right amount of water. Weed your garden regularly to keep it looking beautiful and always trim wilted, dead blossoms to allow new growth to form. Your Turn: How does your garden grow? Share your best gardening tips, secrets, and advice with us in the comments! "Thumbs Up for Charity" Starts March 11!